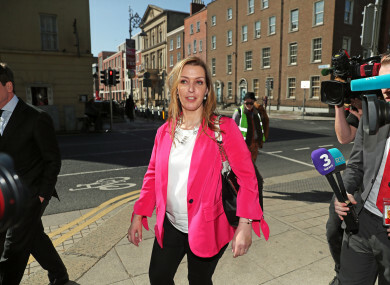 VICKY PHELAN HAS said a revolutionary drug treatment she has been undergoing appears to be working and her tumours have shrunk significantly. Phelan was instrumental in bringing the CervicalCheck scandal to light with her High Court action against a US laboratory over incorrect smear test results from 2011. In January, the mother-of-two was told she had six months to live. Yesterday, having had three doses of an immunotherapy drug, she was told by her doctor that it is already having an effect. Speaking to RTÉ’s Ray D’Arcy, she said she got the news in a salon with her sister and some friends where they were getting their hair and makeup done for a gig last night. I said ‘If this is bad news, I really don’t want to know.’ He nearly cut across me, he said: ‘Absolutely not, Vicky’. He was bursting to tell me to be honest. He said ‘This is just absolutely fantastic news’. He said: ‘You’re just absolutely not going to believe it’. He said ‘there is significant shrinkage in your tumours’. “There was mascara running down faces, the makeup being touched up, but it was worth it,” she said. Phelan explained that this drug, unlike chemotherapy, does not “flood your body” with the drug, it is more exact. Instead, it helps the patient’s own immune system to identify the cancer in the tumours and attack the disease itself. Although she said she is realistic about her situation and does not see this drug as a cure for her cancer, she believes it may allow her to manage the disease longterm. She said her doctor told her this progress will make a significant difference for other patients and for cancer treatment in Ireland in general. At the moment, she said only around 100 people in the country are on the drug and all are on clinical trials. “It took nine weeks of blood, sweat and tears fighting for it,” she told D’Arcy. “I just wasn’t going to take no for an answer. Email “'There was mascara running down faces': Vicky Phelan says her tumours are shrinking ”. Feedback on “'There was mascara running down faces': Vicky Phelan says her tumours are shrinking ”.